A few months ago, the photograph of a reproduction of a Louisiana Creole table crafted by my son-in-law, Brad Romero, appeared in an article about an old home featured in Country Living, a national magazine. 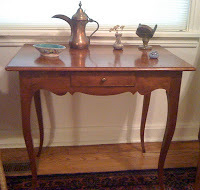 I know about the table’s beauty firsthand because I also have a reproduction of this table in my living room here at Sewanee. I was dismayed to see, however, that Brad’s name appeared nowhere in the article as the artisan who had built this handsome table. I’m publishing a photograph of the table and its creator, along with this puff about Brad’s artistic abilities. 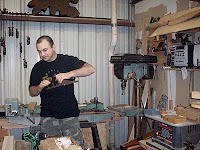 I published a blog about Brad several years ago, and this is a second acknowledgement about my handsome son-in-law of Spanish/Italian descent who owns a furniture restoration business in New Iberia, Louisiana. In addition to the complete restoration of broken furniture, Brad has been turning out reproductions, carefully crafted and refined, that now stand in the rooms of several old plantation homes in Louisiana and more humble cottages like my own. His work fashioning furniture of cypress, pine, oak, walnut, cherry, and Philippine mahogany is a labor of love. Show him a piece of wood and he’s enthralled – long boards of scavenged wood are stacked from floor to ceiling in his shop, aptly named Restorit. My daughter, Stephanie, gave Brad a wonderful book last Christmas entitled Furnishing Louisiana: Creole and Acadian Furniture, 1735-1835, which is a study of early eighteenth-mid-nineteenth century Louisiana furniture, during a time when mass production wasn’t on the horizon, and furniture making involved artisans of French, Anglo-American, Caribbean, Canadian and African descent who hand-crafted their work. Brad particularly admires and reproduces furniture of Creole and Acadian design, and while we celebrated Christmas, he scrutinized the photographs of armoires, tables, and beds in Furnishing Louisiana: Creole and Acadian Furniture, noting dimensions and other facets of the furniture. He has extraordinary visual perception and can look at a photograph of a piece of furniture, then reproduce it faithfully, finishing the furniture so that it appears as a finer piece than the photograph. Regarding the Acadian furniture that Brad also loves, the early Acadians furnished their homes minimally with a few beds, storage chests, one table, two or three chairs and constructed it of a wood that he particularly likes to use – cherry wood. Later, the Acadians used cypress, which was a more available and softer wood, in their furniture making, and only the very wealthy Acadians had cherry wood, according to Carl Brasseaux, noted Louisiana historian. Some of these finer pieces of Louisiana Creole furniture are found in old plantation homes and in museums in New Orleans and Baton Rouge, Louisiana. Brad also builds armoires, including miniature armoires after the style of construction in the early nineteenth century. He researches books and magazines and visits old plantation homes to view these pieces before designing them. In Furnishing Louisiana: Creole and Acadian Furniture, an interesting note on armoires and their durability reveals that a cypress armoire actually survived the 1927 Mississippi River flood which inundated many homes in south Louisiana. Brad achieves the same kind of sturdiness in his armoires. 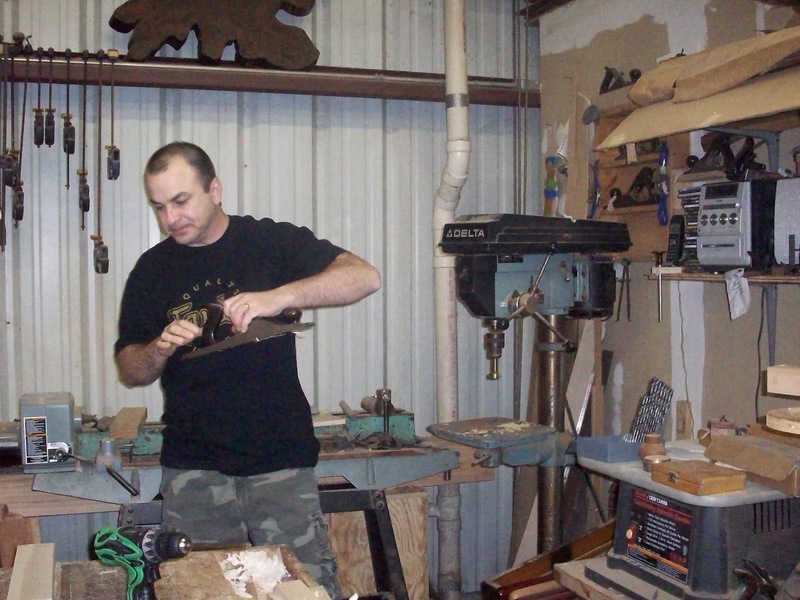 Other products of Brad’s work include the beautiful wood jewelry boxes he constructs and frequently donates to auctions at Solomon House and other charitable and business organizations around New Iberia. The boxes, constructed of mahogany, cherry, whatever wood attracts Brad at the time, have auctioned for $500-$700. Many of them have become part of a private collection owned by an Avery Island resident. I often tell the story about how Brad can spot authentic antiques in stalls of flea markets or furniture stores that advertise antiques. 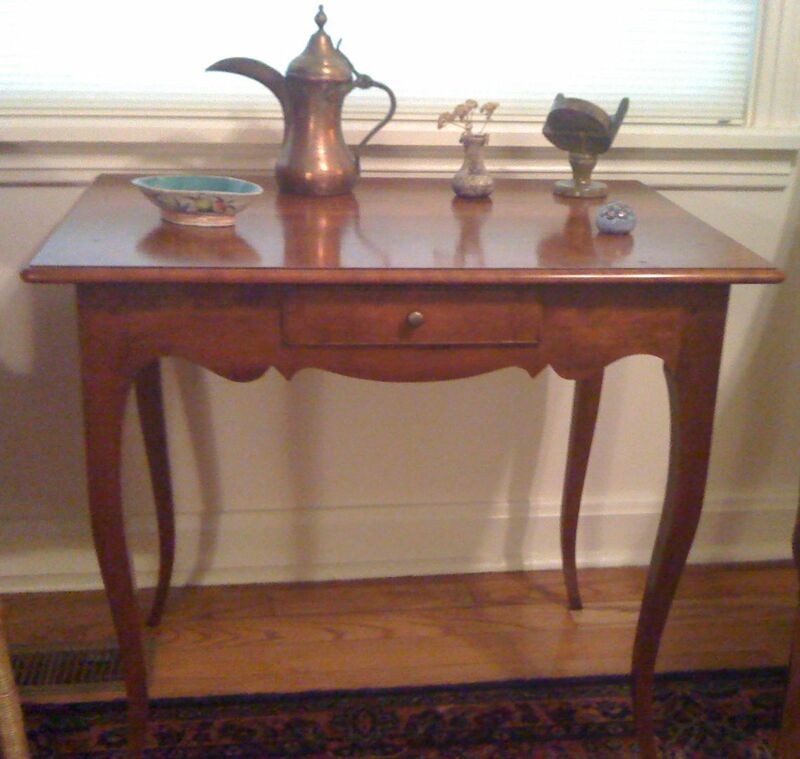 When he accompanied me on a foray for antique pieces to furnish our Sewanee cottage, I pointed out an old china closet in a Cowan furniture store, and he said firmly, “just leave that right where it is.” Most of the time his discerning eyes see more “leavings” than “findings,” and we discover very few pieces that satisfy his refined taste. He’s definitely a purist when we're antique hunting. In his spare time (? ), Brad restores old guitar and violin cases, patches up broken furniture that takes on an expensive appearance once his expert hands have restored it, and has a waiting list of work to be done which projects through a year at a time. He’s the sole proprietor, craftsman, and advertisement for Restorit, and I look forward to seeing what kind of Louisiana piece he has built when I return to New Iberia next month. If you want a glimpse of the work of an artist and craftsman who restores fine furniture and creates reproductions of unique furniture representing Louisiana traditions, Brad’s shop is located on St. Peter Street in New Iberia, Louisiana. His work, c’est magnifique!